Samoyeds are most easily distinguished by their thick white coats which fluff out. They have wedge shaped muzzles and are medium sized muscular dogs. Samoyeds carry their feathery tails rolled over their backs. The Samoyed originated in the Siberia region of Russia. 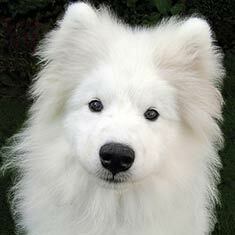 Samoyeds may be pure white, off white or yellow-white. With its thick winter coat, the Samoyed is a seasonal shedder and requires regular brushing. Known as the smiling dog, a Samoyed is dependable and happy and loves nothing more than to play in the snow. This friendly and loyal dog breed loves the company of children. Samoyeds work best in teams and are much too friendly to be watchdogs, though they enjoy barking. 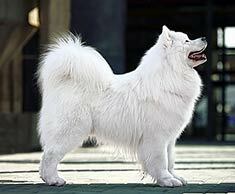 Samoyeds are generally prone to hip dysplasia, diabeties and skin allergies. The Samoyed's life expectancy is about 12 to 15 years. Though Samoyeds can live in both the country or the city, they thrive in an outdoor environment. Find Samoyed Puppies with our Free Breeder search!